Court says 2010 pension overhaul ‘breached its contract’ with city police and firefighters. A circuit judge has ruled that former Baltimore mayor Stephanie Rawlings-Blake, and the Baltimore city council, unlawfully broke their contract with police officers, firefighters and retirees with the passage of a 2010 pension overhaul plan that reduced retirees’ pension benefits. The pension overhaul in 2010 was introduced by Rawlings-Blake, who said the plan would reduce the city’s costs by a minimum of $64 million annually, and prevent an impending fiscal crisis. However, the police and fire fighter unions balked at the proposal. Under the overhaul plan, firefighters and police have had to increase their contributions to the pension fund, which is now 10% of their salaries. Many officers were informed that they would have to stay on the job for 25 years to receive their pensions, instead of 20 years. Retirees also lost a so-called “variable benefit,” which was an annual increase tied to the stock market. Under the mayor’s plan, the youngest retirees received no annual increase through the variable benefit, and older retirees earned only a 1% or 2% annual increase. In June of 2010, Baltimore was sued in the US District Court for the District of Maryland, Northern Division, with the plaintiffs challenging the federal constitutionality of ordinance 10-306, which amended the codification of the Fire and Police Employees’ Retirement System of the City of Baltimore. Judge Rubin did not specify any damages the city would have to pay, but city council members reportedly said the city could be forced to pay out tens of millions of dollars in pension benefits dating back to 2010. 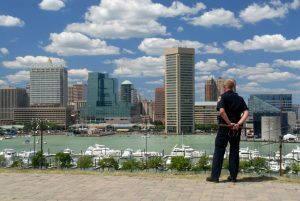 According to a report from the Baltimore Sun, an actuary has estimated the city could be held accountable for as much as $57 million in payments if the city ends up losing the case. According to the Sun, City Councilman Eric Costello, who chairs the budget committee, said $24.3 million has been set aside to pay out in case they lose the lawsuit. The next court date in the ongoing litigation has not yet been announced.